Longest-serving Jewish Home MK won't run for additional term, announces retirement from politics. 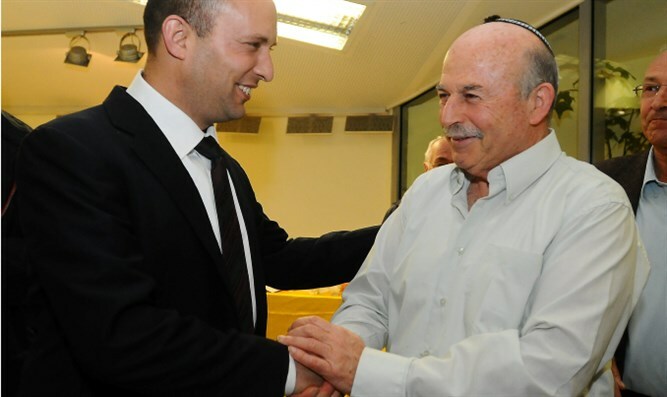 The Jewish Home’s most veteran Knesset Member, Nissan Slomiansky, announced Thursday that he will not run in this year’s legislative election, scheduled for April 9th. The 73-year-old lawmaker, a resident of the western Samaria town of Elkana, told a special meeting of the Jewish Home central committee that he would be resigning from politics. Slomiansky vowed to remain active in the party, however, outside of the Knesset. Currently the most veteran lawmaker in the Jewish Home, Slomiansky has served in the legislature since 1997, when he entered the 14th Knesset with the Jewish Home’s forerunner, the National Religious Party. Prior to his first Knesset run, Slomiansky served as mayor of Elkana for roughly two decades. The Jewish Home’s central committee gathered in Yad Binyamin Thursday evening for a special meeting, as recent polls show the party failing to cross the electoral threshold. Following the departure of Jewish Home chief and Education Minister Naftali Bennett, Justice Minister Ayelet Shaked, and MK Shuli Mualem, the Jewish Home has struggled to pass the threshold in election polls. The newly formed New Right party, founded by Bennett and Shaked, appears to be siphoning off most of the Jewish Home’s votes, causing the party to decline in the polls from nine to 10 seats prior to the split, to between three to five mandates after the breakup. To enter the Knesset, a party must win 3.25% of all valid votes, or the equivalent of nearly four seats.